Verdana Blue and Buveur D'Air, both trained by Nicky Henderson, had it between them from the second-last, where it looked like 1-4 favourite Buveur D'Air was always just going to do enough to hold on. He had made a terrible blunder at the third-last, hardly taking off, although it barely checked his momentum and Barry Geraghty seemingly had everything under control as he took up the running from Global Citizen. However, Nico de Boinville had yet to ask the mare Verdana Blue for everything and she was gaining with every stride after the last. Buveur D'Air had not been beaten over hurdles since the Supreme Novices' Hurdle in 2016, and while he continued to respond for Geraghty, Verdana Blue had too much speed for him this time, providing Henderson with an eighth win in the race. Henderson said: "It is a little bit (strange feeling). You don't want him beaten. Barry is very good. You say you are sorry and I mean that, I will say that to JP (McManus), too. But I know he will say all is fair in love and war. "Thank goodness it was one of our own. Barry didn't think it made a whole lot of difference (mistake at third-last). It didn't stop him. He galloped merrily on. It is the second time he has gone through a hurdle. He said 'no excuses'. 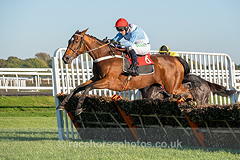 "She is a very good mare and she always has been when you get her on decent ground, as she is no good on soft ground. Unless you can promise it will be good to firm it will be a waste of time (training for Champion Hurdle). "The plan was to go for the £200,000 stayers' race (on the Flat) at Lingfield on Good Friday, as my jockey that day (when winning on the Flat at Kempton), Luke Morris, said that is what she will win." He added: "Buveur will go to either Sandown (Contenders Hurdle) or Wincanton (Kingwell) as they are the only two you have got. Barry is not worried as he said he has won his race. Round here on that ground she is very good."